No airstrikes against Syria in the name of high ideals! On April 13 at approximately 8:30 pm the U.S. imperialists, in coordination with Britain and France, launched a criminal attack by firing missiles on Syria. News agencies reported loud explosions and smoke in the Syrian capital Damascus in the aftermath. The Syrian government reported April 14 that its air defences shot down 73 of 103 missiles. The U.S. claims this attack is in response to the alleged use of chemical weapons by the Syrian government against its own people on April 7, something the Syrian government adamantly denies. This U.S.-led attack was launched the day before chemical weapons inspectors from the Organization for the Prohibition of Chemical Weapons were set to begin their work, as requested and facilitated by the Syrian government, to determine if chemical weapons were in fact used. The Communist Party of Canada (Marxist-Leninist) denounces this attack and reiterates its stand with the people of Syria, who for seven long years, have been subjected to foreign-backed aggression and terrorism disguised as a civil war. The aim is to impose regime change on a country that seeks to exercise its right to a peaceful and independent existence, a right that belongs to all countries big or small and forms the foundation of international law. The attack on Syria is also an explicit threat to Iran and Russia, two countries that the U.S. sees as undermining its aims in Syria and the region. It should be remembered that just over a year ago, in April 2017, U.S. airstrikes in Syria released toxic chemicals that by all indications were stored in facilities used by terrorists. The U.S. and its monopoly media mouthpieces tried to spin this as a chemical attack carried out by the Syrian government and used it to justify a missile strike on a Syrian air base. CPC(M-L) urges everyone to oppose this disinformation by organizing actions to oppose war and aggression and discussing with their co-workers, families and friends the urgent need to oppose U.S.-led aggression, Canada’s support for this aggression and any possibility that Canada could become further embroiled in these crimes. 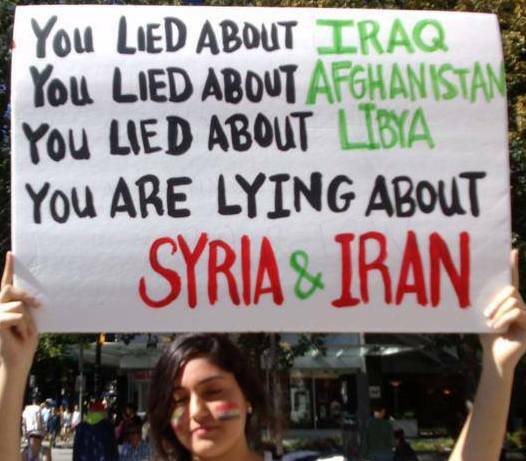 Already around the world, emergency anti-war actions have been called, with one at the White House on April 14 followed by a teach-in at George Washington University and another in Britain at Parliament Square in London on April 16. 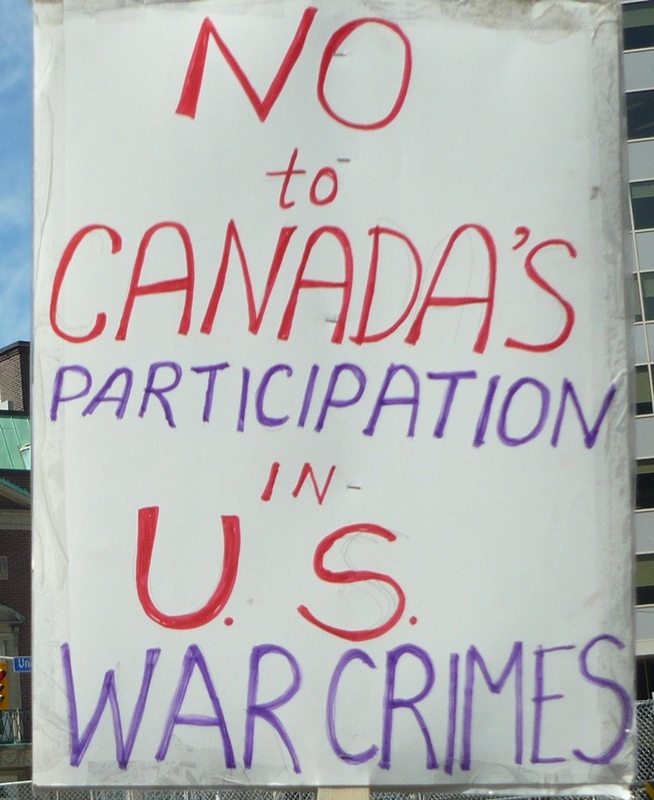 Canada must be a Zone for Peace, and this can only happen if the people organize to make it so. “The Assad regime and its backers must be held accountable and any further attacks prevented immediately. Russia, with its unwavering support for the regime, ultimately bears responsibility for these brutal attacks, targeting of countless civilians, and the suffocation of Syria’s most vulnerable communities with chemical weapons. By shielding its ally Syria, Russia has breached its commitments to the United Nations as a framework guarantor. It has betrayed the Chemical Weapons Convention and UN Security Council Resolution 2118. Russia’s protection of the Assad regime and failure to stop the use of chemical weapons in Syria calls into question its commitment to resolving the overall crisis and to larger non-proliferation priorities. 2. On March 13 at the UN Security Council, U.S. Ambassador to the UN Nikki Haley threatened that “any nation that is determined to impose its will through chemical attacks and inhuman suffering, most especially the outlaw Syrian regime, the United States remains prepared to act if we must.” She then reminded the Security Council of the deadly U.S. missile strikes against a Syrian airbase in April 2017. The U.S. Ambassador’s threats were made in the context of a so-called ceasefire proposal by the U.S. This proposal sought to halt Syrian and Russian military operations in eastern Ghouta, which the Syrian government was liberating from armed groups, setting the stage for a negotiated settlement whereby armed fighters were permitted to leave the city in transportation provided by the Syrian government so that civilians could return to the city. “The repeated and morally reprehensible use of chemical weapons by the Assad regime in the past has been confirmed by independent international investigators. It is part of a deliberate strategy to terrorize local populations and force them into submission. Canada condemns the Assad regime – and its backers, Russia and Iran – for its repeated, gross violations of human rights and continued, deliberate targeting of civilians. “Canada expresses its admiration for the medical workers and other organizations, including the White Helmets, who have been working tirelessly to save the lives of those affected. Our most sincere condolences go to the families of the deceased.